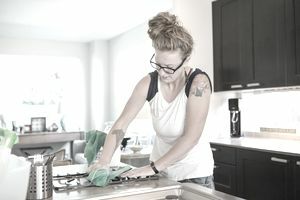 Cleaning your house with green or environmentally friendly cleaning products is good for the earth and for keeping your family members and pets safe from chemicals. Many people who want to use green cleaning products often hire green house cleaning professionals to clean their homes with the safest products. If you have an interest in the environment and enjoy cleaning, a green cleaning business could be a good business idea for you. A green cleaning business is relatively easy to establish. It's environmentally sound because green cleaning products reduce chemicals and are better for humans and animals. The startup costs are minimal. You can easily add to your services to provide a well-rounded experience for your clients. You can add staff to expand your business. You can target households and businesses. It's hard physical labor if you do all of the cleaning yourself. You really need to enjoy cleaning. You may find that it's tough to generate business in a down economy. You will have to purchase green cleaning supplies. You need a thorough knowledge of green cleaning techniques and products. You may need to be bonded and insured to work in others' homes.